Inverter Repairs. We have been repairing ABB Inverters for over 20 years. Repairs are carried out at our centrally located facility in Ilkeston, Derbyshire, or if it is not expedient to move the drive, we can repair the inverter at your premises. In an emergency we can use our hire fleet to keep you operational, avoiding loss of production and down time whilst we carry out the necessary repairs. We are fully insured to handle your inverter from collection to return. 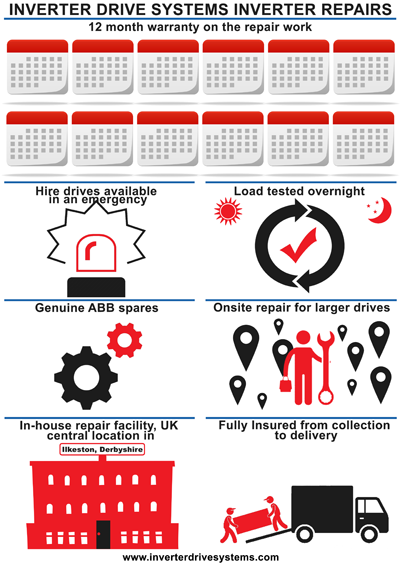 Our inverter repairs service is available 24 hours a day, 7 days a week with priority going to our service contract customers. To find out more about our inverter service contract, click here. Preventative maintenance is always better than a cure! Did you know? We offer inverter technical advice on everything from harmonic distortions to inverter commissioning, upgrading from DC motors to soft starts… if in doubt ask – it’s what we are here for!